The full culinary lineup for the world’s largest bourbon festival is out. Bourbon & Beyond attendees can expect to see the likes of Decca’s Annie Pettry teaming up with New York and Washington, D.C. chef – and Louisville native – Akhtar Nawab demonstrating best-of-the-bluegrass dishes. Milkwood’s Kevin Ashworth joins Cincinnati chef Jose Salazar to show why a great steak pairs better with bourbon instead of red wine. Festival bourbon curator Fred Minnick partners with Top Chef head judge Tom Colicchio to discuss the chemistry of good food and drink—how the chemical transformation of bourbon in the barrel mirrors the techniques of food in the pan. These chefs round out the unparalleled entertainment taking place at Bourbon & Beyond September 22 and September 23 at Champions Park in Louisville. It includes live music sets by Sting, Robert Plant & The Sensational Space Shifters, John Mayer, Lenny Kravitz, Counting Crows, David Byrne, plus dozens more, as well as 30 bourbon and food-focused experiences. 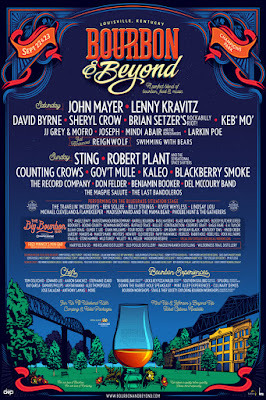 For more information and to purchase tickets, visit bourbonandbeyond.com. Various musicians performing at the festival will also get a chance to show off their culinary prowess. Look for more details to be announced in the coming weeks. Beloved bourbon bar and restaurant The Silver Dollar will host an exclusive drink experience featuring experimental, rare and hard to find bourbons at The Hunter’s Club. Those looking for additional experiences beyond Champions Park can take part in exclusive distillery excursions from Mint Julep Experiences including Blade & Bow, Bulleit, Jefferson’s Reserve, Jeptha Creed, Kentucky Artisan, Limestone Branch, Maker’s Mark and Wild Turkey. Bourbon & Beyond is also partnering with the Muhammad Ali Center, which will host the Friday Night Supper Club in addition to offering festival ticket packages with special museum admission pricing and opportunities to attend the nationally recognized Muhammad Ali Humanitarian Awards. St. Paul & The Broken Bones | Iroquois Amphitheater | 8 p.m. Bourbon & Beyond is the world's largest bourbon festival, an annual celebration of award-winning bourbons, master distillers, legendary musicians, chefs, and an unforgettable showcase of the craftsmanship, soul and spirit of Louisville. 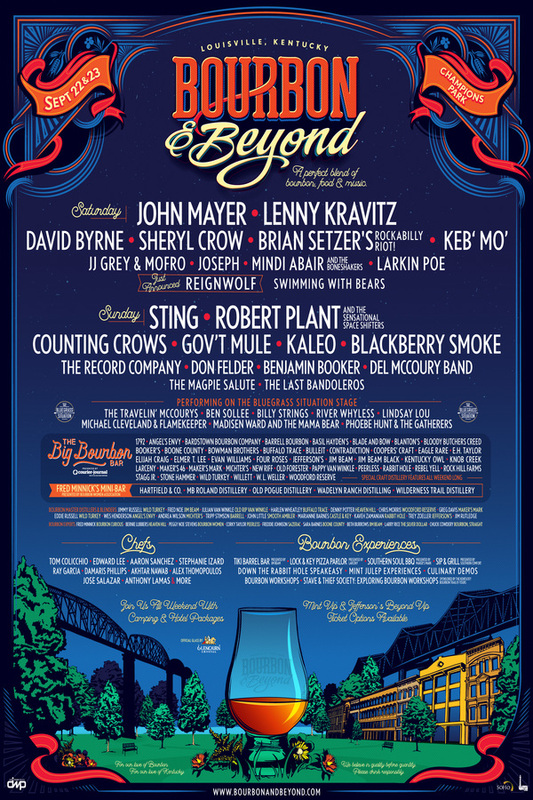 Sting, Lenny Kravitz, Robert Plant, John Mayer, Counting Crows and David Byrne headline the entertainment when Bourbon & Beyond returns to Louisville Sept. 22-23. Two dozen master distillers, blenders and experts from the top brands will take part in 30 bourbon and food-focused experiences. Culinary curator chef Edward Lee will join Top Chef head judge Tom Colicchio, Iron Chef Gauntlet winner Stephanie Izard, and MasterChef judge Aarón Sánchez along with dozens of the hottest chefs in the country to round out this can't miss weekend. More on tickets and schedule at bourbonandbeyond.com. Since 1993, music industry veteran Danny Wimmer has been producing concerts and festivals, both large and small. In 2011, he formed Danny Wimmer Presents, which now produces several of the largest rock and alternative festivals in the U.S. By combining A-list talent with local cuisine and culture, DWP has become recognized within the industry for delivering the highest-quality entertainment experiences to fans, artists, sponsors, partners and host cities. DWP creates memorable and all-encompassing festival experiences, leaving both consumers and partners with lasting and meaningful impressions. DWP will continue to add new music festivals to its already stellar portfolio, which includes Rock On The Range, Monster Energy Aftershock, Monster Energy Welcome To Rockville, Monster Energy Carolina Rebellion, Louder Than Life, Bourbon & Beyond, and Chicago Open Air, among others.